Product prices and availability are accurate as of 2019-04-25 07:51:32 UTC and are subject to change. Any price and availability information displayed on http://www.amazon.com/ at the time of purchase will apply to the purchase of this product. 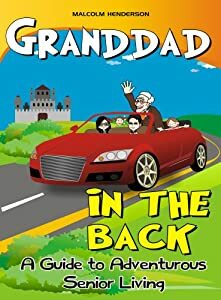 We are currently offering the fantastic Granddad in the Back : A Guide to Adventurous Senior Living for a reduced price. Don't miss it - purchase the Granddad in the Back : A Guide to Adventurous Senior Living here today! As I approached my eightieth year, those who care for me were telling me to slow down and restrict my activities to what they considered to be appropriate to my age. Everything being suggested pointed to a loss of freedom and a submittal to the control of others. In dread of being confined to a geriatric life style, I set about finding ways in which cope with the problems of physical deterioration and thereby allow me to continue to function independently. I soon found this to be a positive and invigorating project laced with both practicality and fun. The idea for the book came me at the end of holiday spent in France as guest of two friends and their daughters. We left the hotel at dawn to catch the car ferry back to England. Richard was driving; his wife Lulu was beside him navigating and I was in the back doing peacekeeping duties between their the children with whom I have long had a good relationship enhanced by a week of beach activities and babysitting. I have a thing about French coffee drunk in France from large bowl-like cups while dunking fresh croissants. I had more refills than was sensible in the half hour before our departure. An hour up the autoroute I realized I could do with a bathroom break. When a sign announced the next stop in 26 kilometers, I suggested we stop. “Sorry, Malcolm! It is too soon to stop” Richard decreed. “We will stop at the following one in 76 kilometers.” We shot past the stop at high speed. I managed to last out only by reliving a freezing afternoon in Morton Bay, Queensland, when I was a guest crew-member on a yacht competing in a sailing race with no opportunity to take a leak. It was sheer will power that had saved me on that occasion and I managed to muster the same once again but at a cost of agony of mind and body. It was at the rest stop that I devised my Rest Stop Strategy. Out of parental ear-shot, I made a deal with the girls. On receiving a dig in ribs from me, one or both, it didn't matter which. would call out in an urgent voice “Dad, please I must go pee pee now!” Each successful stop was rewarded with a chocolate bar or ice cream of choice. Having found the means for taking control of the frequency of rest stop breaks, I set out to devise a “War on Aging” training course and enrolled myself as its first student. Maintaining control, not over others, but of your own life, is key to getting maximum satisfaction out of each day spent spent in life's finale which can be the highlight and climax of the whole show.